FILE - Britain's Prime Minister Theresa May leaves a cabinet meeting at Downing Street in London, Jan. 15, 2019. Brexit banners lie on the ground near parliament in London, Britain, Jan. 17, 2019. 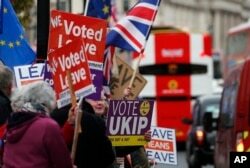 Brexit supporters protest opposite the Houses of Parliament in London, Britain, Jan. 15, 2019. 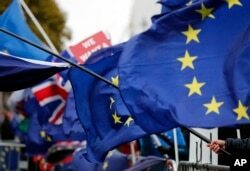 The EU and British flags are seen at the demonstrations area near the parliament building in London, Britain, Jan. 16, 2019.